At Bitner Electric we specialize in commercial, industrial, and residential electrical maintenance and construction. Our electricians provide comprehensive solutions to meet the needs of our customers in Harrisburg, Pennsylvania and the surrounding areas. We also provide electrical services for parking lot and security lighting, data and communication cabling, and telephone pole installation. We have 24 hour electricians on call to provide our customers with emergency electrical services. At Bitner Electric we know that the electrical systems you rely on every day need to be consistently maintained. Our stocked vehicles are prepared to respond to an emergency service call day or night. If you need an experienced electrical contractor in the Harrisburg area, turn to Bitner Electric. We pride ourselves on the specialty equipment and services that we are able to provide for our customers. 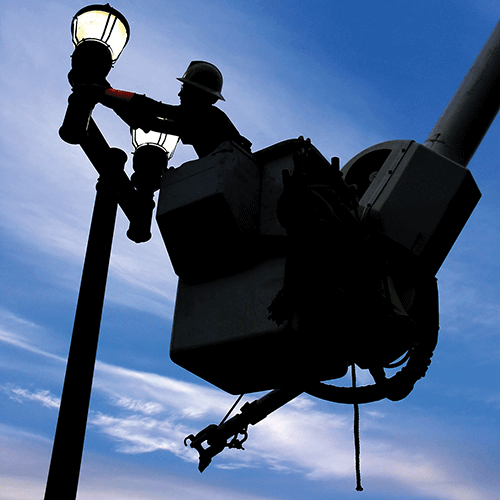 Our specialty electrical services include sign lighting and repair, generator and UPS installation, and bucket truck service (up to 55 feet). We also have utility and telephone poles in stock that are available for installation or purchase. Our data technicians install and maintain the latest technologies in computer network and communication cabling, and are trained in ANSI/TIA/EIA standards. Learn more about our data cable installation and what our electricians can do for you. We have serviced the electrical maintenance and construction needs of the Central Pennsylvania and Northern Maryland areas since 1975. For over 40 years our electricians have developed a reputation for high standards and quality workmanship, and we have strived to consistently offer reasonable prices to our customers.